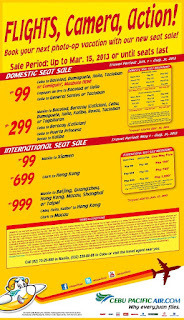 Low-cost airline Cebu Pacific announced a new seat sale promo offering as low as 99 Pesos base fare on selected domestic and international destinations. The travel period is from May 1 to August 31, 2013. 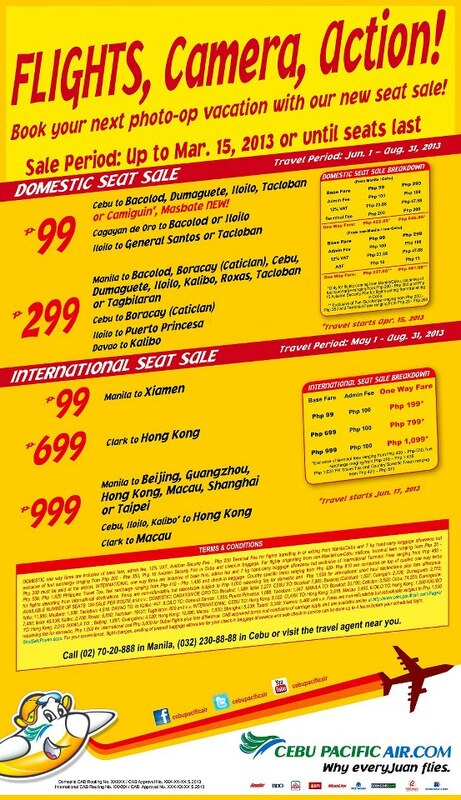 Tickets can be purchase online at www.cebupacificair.com or at their designated payment centers and ticketing offices. The promo offer is valid until March 15, 2013 or until tickets last. Low-cost airline companies encourage people to fly by offering them discounted fares on future flights. The premise though is that the tickets are non-refundable and non-rebookable, except when the airline cancels the flights or make huge changes. See the terms and conditions for further details.